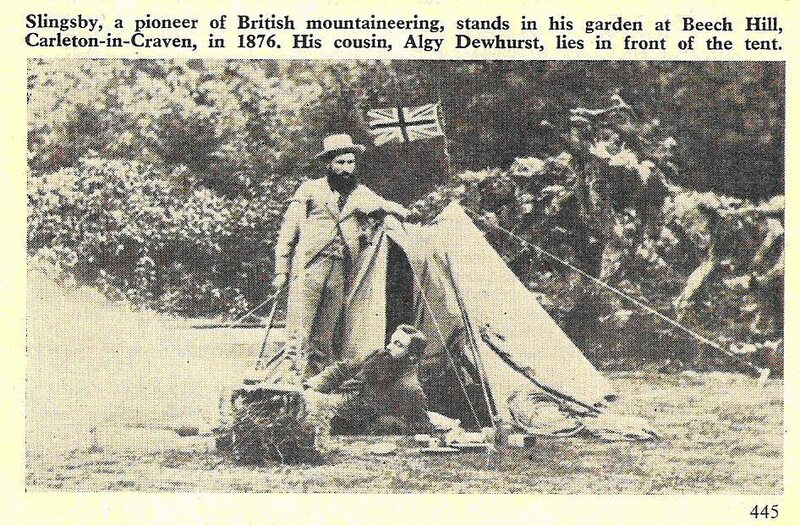 Recent achievements of British climbers, from the Andes to the Caucasus, owed a great deal to the pioneering efforts of Cecil Slingsby on the high peaks of Switzerland and Norway. A fierce Alpine wind howled about the climbers as they made a slow descent from the Aiguille du Plan. Tired to the point of exhaustion, they had spent the last fifty-four hours - nearly two and a half days - in a non-stop attack upon one of the grimmest peaks in the Alps, and they knew that they must reach. the valley before nightfall if they were to escape disaster. The leader was a man of broad shoul¬ders, a neat but full beard, and a classi¬cal profile to set off the weather-beaten face and twinkling blue eyes. As the descent became worse he was always equal to the task: a human steam-roller with an ice axe that cracked unceasingly into the hard mountain and who, on a vertical ice-wall which would make even the most daring of climbers tremble, turned to his companions and remarked, "Well, it's been a glorious climb!" He was William Cecil Slingsby, one of the leaders of British mountaineering. Cecil Slingsby was born in 1849 of an old established Yorkshire family. Brought up at Carleton, among the lovely dales and sweeping moors he quickly developed a passion for climbing, trying his hand at local stone outcrops and wander¬ing for hours over the fellsides. It was not until he read Edward Whymper's Scrambles in the Alps, however, that he seriously considered bigger things. Like many a young person of that time, Slingsby's imagination was set on fire by the stirring deeds among glacier and high peak which 'Whymper recounted. That book, more than anything else, decided Slingsby upon his career as a mountaineer. He was excellently equipped for the sport which he had chosen. Of rugged build, he had the stamina and the vitality to overcome hardship; he had a gift for teaching others (which was later to prove very useful), and he had the uncomplaining good humour which is so necessary on a long climb. It says a lot for Slingsby that no attempt he ever made upon a mountain failed, and no. party he ever led came to grief. In the terrible descent from the Aiguille du Plan, he succeeded in bringing his two companions. safely to the valley when all the odds were against him. Cecil Slingsby seldom talked about his own part in any expedition, and what little we know about his courage and skillfulness has come down to us from stories told by his companions. It is known, though, that he spent a dozen short "seasons" in the Alps, and that he had success in being ,the first to climb several formidable peaks. He climbed with friends, but without guides -an almost unheard of thing in those early days. Despite his successes in the Alps, Slingsby was too energetic to confine his climbing to short holiday periods in Switzerland, as many of his Victorian friends did. At home he became one of a small band of enthusiasts who pioneered our own crags, and through clubs and lectures he did much to bring the sport within the reach of all who cared to take advantage. Many of our present climbing clubs, and the routes which they climb, owe their existence to the work of Cecil Slingsby. It is only natural that a man like Slingsby, so full of enthusiasm and a born teacher should bring up his entire family with a liking for the sport he himself had chosen. He firmly believed that it was never to a young to start climbing, given good guidance, and his younger son Laurence was undertaking difficult climbs at the age of nine! This great pioneer had his successes in the Alps and at home, but his greatest triumphs were in Norway, a country almost unknown to British visitors in, his day. A DAUGHTER'S MEMORIES Mrs. E. Winthrop-Young, Slingsby's youngest daughter, writes: He was about fifty when I first remember him - my mother was forty. He was young and gay and vigorous. He kept all five children (I had three much older sisters and one brother) in great order on crags and hills; we had• to obey him, even when we were climbing those loose Craven stone walls. If a stone dropped we were in complete disgrace, and he taught us a great deal in Carleton Ghyll, which I still visit alone and walk up now and then. There was instruction on crossing becks properly, and he took a clean envelope with him on these walks and made us drink the iron water out of a spring in the lower part of the Ghyll. From a special "View Gate" up on Carleton Moor he would point out the distant Lakeland fells when the visibility was very clear, and he also indicated Ingle¬borough, which he loved greatly. Flasby Fell, above Gargrave, was always his favorite local hill. I had an entrancing time with my father in 'July to August, 1921, when he took me to Norway for my first visit. All the other older children had been before several times. Everywhere father met friends - known and unknown. The most charming thing I re¬member is walking up to Turtagrö, that home of mountaineers in Norway. A rough-looking shep¬herd came up, seized father's arm and said, in Landsmal dialect, which father spoke well, "Are you Slings by?" A Norwegian Charge d'Affaires in the Embassy at Ahtnes told me a few years ago he was so cheered once in the blackest days of the occupation and war in Norway to see father's photograph looking out cheerfully and hopefully at him from a wall in a house on, the Sognefjord! Father went bear-hunting with, Grieg once or twice. In Norway, Cecil Slingsby felt more at home than in any other country and more at home than in some parts of England! He felt that the Norsemen and his own part of Yorkshire had common bonds stretching back over the centuries to the days when the Vikings used to raid our eastern shores. Norway could give him all he wanted: - a link with home, wild mountains which were mostly unexplored, shooting, fishing, and the companionship of the most friendly nation on earth. He had first visited the country when he was twenty-three and he had become so fascinated with all that he saw that he studied the history and language until he became a recognized expert on Nor¬way. Time and again he made the jour¬ney across the North Sea, pushing his way over remote glaciers and wild valleys to forgotten hamlets and farms; explor¬ing, climbing, making friends wherever he went. On these journeys his guide would be some local farmer, and it was here that Slings by's gift for teaching became a great asset, because he taught several of these rough farmers to climb and to become guides in the real Alpine sense. Sometimes, too, Slings by would be accompanied by a more educated Nor¬wegian from Bergen or Oslo, and he so infected these people with a love for their own mountains that they in turn took others, until mountaineering became one of Norway's most popular pastimes. In England, too, Slingsby, by means of lectures and talks with his friends, opened people's eyes to the beauty; of the deep fjords and high mountains of the Northern land. As a result of this, a country which was once regarded as a barren wilderness became a popular holi¬day place for English visitors. Because this helped the Norwegians to earn a better living, and because Slingsby was known to rich and poor alike, it was once said of him: "There are two patron saints of Norway - St. Olaf and Cecil Slingsby!” Always on the lookout for some new experience, this energetic Yorkshireman did not take long in realizing the sport which could be got from skis. In Norway they had been a mode of transport for centuries; but nothing else. It took Slings by to teach the Norwegians how their old-fashioned transport could be put to new and exciting uses. He was also the first man to take Norwegian skis to the Alps and teach the locals how to use them. 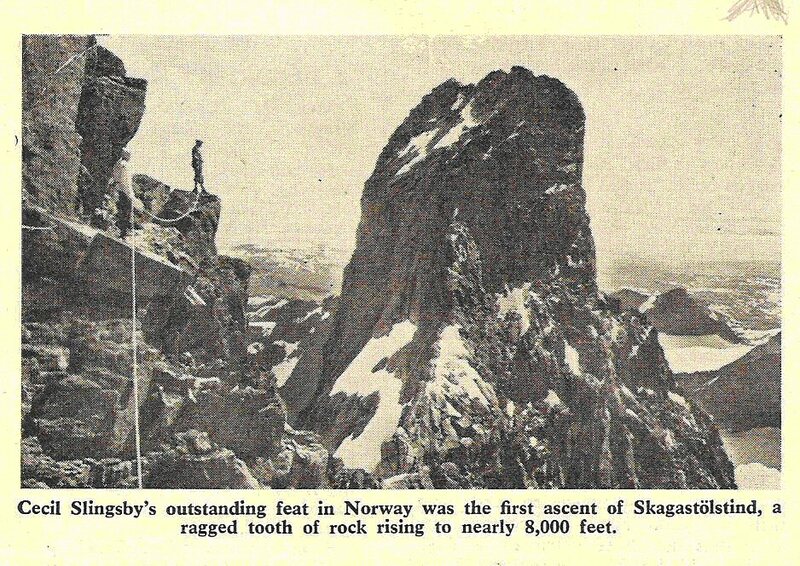 During his many journeys amongst the wild mountains of Norway, Cecil Slingsby made many "first ascents" of the rugged peaks, but his outstanding feat was undoubtedly the first ascent of Skagastolstind; not the highest mountain in Norway, but certainly the most fear¬some: a ragged tooth of rock rising to nearly 8,OOOft. His companions on the occasion were two Norwegians: Emmanuel Mohn, a schoolmaster, and Knut Lykken, a guide. The three men set out from the saeter (a sort of croft) at Vormelid at 3 a.m. on 21st July, 1876, and ascended into the valley around which the Skagastölstind group of mountains ranged. At first they had trouble in finding their quarry in the wild jumble of peaks, but at last they got to grips with the mountain. ALL went well until the notorious "top-knot" of the peak was reached. This was a great tower of sheer rock which caps the .mountain and makes it look inaccessible, and the sight of it caused Lykken and Mohn to surrender. Slingsby, however, after carefully weigh¬ing his chances, set out alone for the last five hundred feet, and after a strenuous and exciting time, he stood on the sum¬mit of Skagastölstind. Cecil Slingsby became a legend in Norway even in his own lifetime. When, as an old man, he made his last active tour of the country, crowds gathered to welcome him at every hamlet, Norwegian mountaineers assembled to pay him homage and he was received in audience by King Haakon. Even today he is far from being forgotten. ‘remember how, a few years ago, stood in a mountain hotel in Norway gazing at the numerous photographs which lined the wooden walls. One of them was heavily framed and stood out from the rest. "Ah, sir," said the landlord with pride, "now that is Mr. Slingsby." For as long as he was active Cecil Slingsby climbed. Even when past the seventy mark, when most men are con¬tent to sit by the fireside, this bundle of energy was climbing on Pillar Rock and Gimmer Crag, two of the most severe climbing areas in Britain! There was hardly a sport in which he had not taken an active part at some time of his life. To Slingsby, sport meant life, and even when, at the age of eighty-¬one, he lay on his deathbed, he watched through the window some boys playing cricket. Suddenly the batsman gave a lusty swipe, sending the ball for six. Slingsby was overjoyed. "Well played, well played, my boy!" he cried. They were his last words.